I suppose it wouldn't be right if we didn't have a quick look at the two other Star Gods that remain for my New Necron Codex review, The Void Dragon and The Outsider! There are implications that The Outsider is named so because it is physically outside of something, possibly the galaxy, and I cannot foresee the Outsider ever making it into the new Codex! We know that the Void Dragon may be on Mars, and that it may be feeding to return to strength! 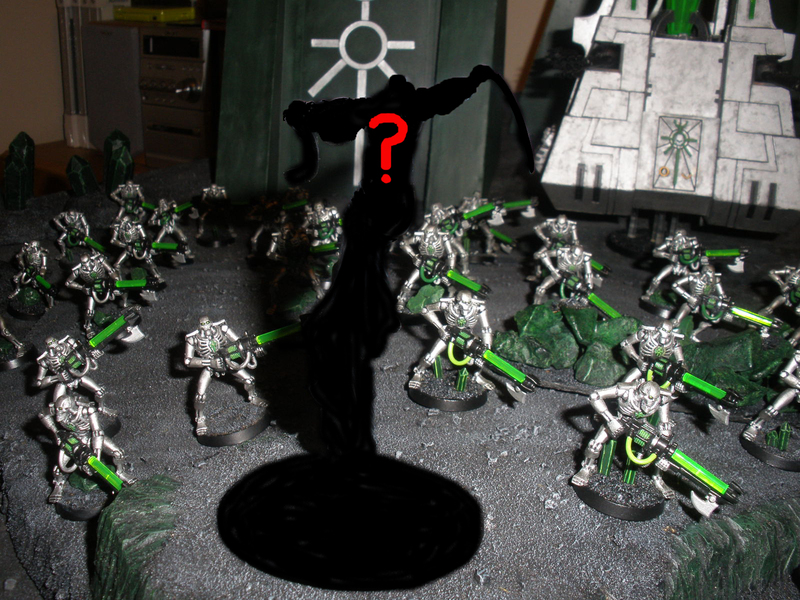 So there is a chance that it could make a HQ slot in the next Necron Codex. The Void Dragon is said to be the most powerful of the four remaining C'tan, so what sort of stats would it have? It is said that The Void Dragon can control and consumes victims slowly through the use of technological implants and may be able to remotely control technology over vast distances, so it certainly has some interesting points that could be utilised. Maybe it could control your opponent's vehicles in some way? rolling on a chart for the result? A six and it's immobilised? On a personal note, I would love to have a C'tan that can move 12" or at least fleet, or both! What rules do you think would be good for a new C'tan? If I recall correctly, the Outsider remains dormant within a dyson sphere somewhere in the path of a Tyranid hive fleet. The Tyranid fleet divides around the dyson sphere, avoiding a huge radius around it. Presumably the fact that it disrupts the Tyranid hive fleet suggests that it disrupts Warp communication in this radius. This in turn suggests that the Outsider is actually "outside" the Warp on a level that is completely unmatched by any other null, untouchable, or soulless creature, and creates a huge dead zone. The dyson sphere structure may also be involved, whether it reduces this radius to a "manageable" distance, or increases it to the span of light-years. That said, a C'tan with Soulless and a radius of psychic protection wouldn't be amiss. Where do you think the Machine Spirit comes from? Why does it so happen that all technological developments happen on Mars? I think the Adeptus Mechanicus found the Void Dragon a long time ago and and have been reverse engineering some of the technology from it, one prime example being the Machine Spirit. Maybe it wakes up and escapes? could move the overall plot of the 40k Universe along. I like the idea of the outsider being a super null. Can you say parihs as troops. Another nice trice would be to disable all machine spirits in 24" not a super powerfull trick just useful.